GREG Harding wanted a refresher and has got that back in charge of the colts at Swan Districts and not only does he hope his team wins its way through to the Grand Final, he has no doubt up to half of his group has a future at senior level. 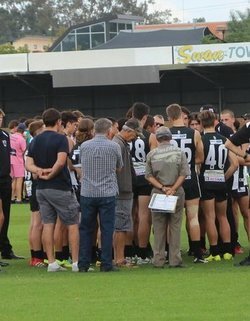 Harding did initially coach the colts at Swan Districts with great success both in terms of winning a premiership in 2008 and getting players ready for an AFL future before he took over as league coach with the black-and-whites after the triumph of 2010 under Brian Dawson. There were some tough periods off the field during his tenure from 2011 up until the end of 2017, but Harding did an impressive job leading Swans to finals in four of those seven years including a stirring elimination final win over West Perth at Steel Blue Oval last year. But Harding felt it was time he moved on to allow both a fresh voice to take over the league playing group and for him to experience something different again after seven seasons at the helm. The coaching job with the colts at Swan Districts was something that immediately appealed to him and now heading into Sunday's preliminary final, he couldn’t have enjoyed the season any more. Under Harding's guidance, Swan Districts finished the season in third position in the colts heading into a qualifying final against Peel Thunder which they won by nine points to set up a second semi-final battle with minor premiers, Subiaco. While Swans came up short on Sunday at Leederville Oval with Subiaco moving straight through to the Grand Final at Optus Stadium, Swans' season stays alive now with a preliminary final battle this Sunday against Peel Thunder at Fremantle Community Bank Oval. That means that Swan Districts still has a chance to take part in the first ever colts Grand Final at Optus Stadium on Sunday September 23, but more importantly Harding has enjoyed his year with the colts and the amount of exciting young talent coming through at Swans. "It's always good to go back and just get a fresh bunch of boys to coach with the young boys coming through. We've got a lot of 17-year-olds and young boys who I really rate and to get back to more of a development focus has been great fun for me," Harding said. "I think from the start, we've looked at it and thought there's a lot of boys who can play WAFL footy and I still believe that. "We've already seen Cameron, Bain and Graydon Wilson go up this year and I just reckon there'll be another five or 10 names out of this group that will elevate as well in the short-term." The bonus for the successful season Swan Districts had in the colts is that despite Sunday's loss to Subiaco, there's still another chance for them to book a spot in the Grand Final and Harding is expecting quite the ball against Peel on Sunday given what's at stake. "You get a double chance and you work hard for a double chance for a reason, and this is it. It just allows you that if you don't quite get things right on one day, it allows you to butter up and have another crack. That's where we are at now," he said. "We played Peel last week and it was a back and forth contest, but in the second half we were really strong and it felt like we controlled big periods of the game. "These boys are a great bunch of boys and I'm sure we will bounce back really strongly and next week will be a cracker, but I'm sure we can be really competitive." As for the second semi-final loss to Subiaco, Harding felt they perhaps deserved to be in front at quarter-time after an encouraging start but scores were level at quarter-time before the Lions began to pull away to end up winning by 46 points. But there was still quite a bit for Harding to like about Swans' performance and he feels they could turn the result around in the Grand Final if they got there. But he's fully aware they can't afford to look past Peel this Sunday in the preliminary final. "Looking at them, they are probably the most complete little group in the colts comp in terms of getting an even spread of really good effort and application. That's what basically the difference was," Harding said. "They didn’t sort of beat us with any great brilliance, we were able to control Schofield with Benny Taylor for the majority of the game and Mayo kicked poorly for goal. "But if you had said that Mayo had kicked zero and Schofield and Hickmott didn’t have their usual dominance, you'd say you were close. But it's just that even spread they have of contributors across their group was good enough to beat us, and beat us comfortably." Mitchell Bain played well against Subiaco with 24 possessions and six tackles while Blake Pescud had 18 disposals, Graydon Wilson 18, Seb Bright 18 (nine tackles), Riley Garcia 16, Jackson Beck 16 and Denzel More 16. Kade Wallrodt also kicked four goals and Ethan Nordahl two while Ben Taylor had a good battle with Subiaco's Liam Hickmott. So there were players that did well for Swan Districts but Harding knows they need closer to a full contribution from all players if they are to firstly make the Grand Final, and then have a chance at winning the premiership. "I think we can get a massive lift from five or six boys on top of the fact that we didn’t have positional strength, we had half a dozen boys who if you asked them personally weren’t at their best. That's a positive," Harding said. "We've had to string together a couple of pretty good games in-a-row firstly to get the double chance and then we played really good footy last week against Peel. It's never going to be a straight line of improvement. "Next week against Peel we are going to have to jump up and play some really good footy. They are a really good footy team with multiple weapons, but if we can just get back to that nice even spread of contributors we are going to be hard to beat."